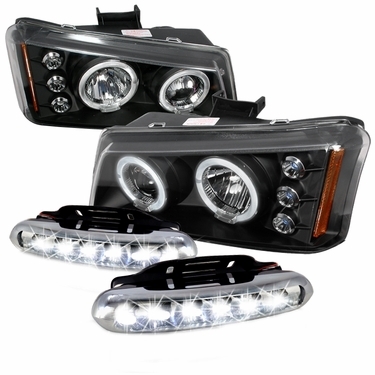 03-06 Chevy Silverado Halo Projector Headlights. The Projector Headlights Kits Provide For Intense Light Beam Concentration. Innovative & Unique Design That Customize Your Vehicle, With Only The Fraction Of Oem Headlights Cost. You May Also Upgrade The Light Bulbs To High Intensity Discharge (Hid). The Headlights Is Securely Mounted By The Original Screws & Nuts Of The Oem Parts. Installation Should Take Approximately 1 1/2 Hours. If You Are Unsure About Installing Automotive Accessories By Yourself We Recommend Consulting A Body Shop. Direct Plug & Play Installation, 03-06 Chevy Silverado. BRAND NEW 03-06 Chevy Silverado Halo Black Projector Headlights + Day Time Running Chrome LED Fog Lights! 03-06 Chevy Silverado projector headlights are the way to go. The lights are sleek with halo (angel eyes) and LEDs on the outer sides of the headlights. Moreover, Chevy factory headlights have a high cost, but the projector headlights that come with more style are only at a fraction of the cost. The lights come with a total of 2; which is a passenger side and a driver side. Same as the picture above. Also, the black housing is a matching set for any color Silverado.